Time spent enjoying winter sports can be cut short if you are not prepared to keep warm. This is especially true with sports that require you to stay still for extended periods of time such as hunting, ice fishing, or snowmobiling. This can be prevented, however, if you equip yourself with the right cold weather gear. The boot blankets are 10 inches high, giving them enough length to cover any winter boot. They have a drawstring at the top that helps secure the boot and keep cold air, snow and ice from entering the foot area. The boots have a rear closure nylon zipper for ease in putting them on and off. This makes them perfect cold weather gear. The overboots have a quiet vinyl sole (not intended for walking). This additional benefit helps hunters remain discreet while staying warm. Boot blankets are in a camouflage print and also have loop at the top for easy carrying. Hunters that know they will be in a tree stand for extended periods of time, or for any other winter sports enthusiast, worrying about their hands becoming too cold should consider a HanBlanket. This incredible hand warmer is perfect when you need to sit still for long periods of time in the cold. So using these cold weather gear products can help you stay warm on your deer stand. Constructed of 2-ply insulation and acrylic pile lining, this hand muff is specially designed to allow you to place your hands in and out of the blanket without making a sound. The elastic openings make using the muff soundless, and the elastic acts as an additional barrier from the cold and snow. Available in blaze orange or camouflage, the HanBlanket is the perfect addition to your cold weather gear. 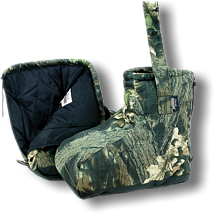 Stay warm using our cold weather hunting gear our boot cover is the perfect cover for you hunting boot. No one wants cold feet while hunting so get the best cold weather gear available for deer hunting with our boot and hanblankets.